ON DVD AND DIGITAL MARCH 3, 2015! DVD Includes Bonus Full-Length Feature, “Elmo and Abby’s Birthday Fun”! BURBANK, CA (February 18, 2015) – Elmo is back and more lovable than ever as Warner Bros. Home Entertainment and Sesame Workshop, the nonprofit educational organization behind Sesame Street, release Sesame Street: The Best of Elmo 3 on DVD and digital on March 3, 2015 for $14.98 SRP. This trip down memory lane will teach Elmo fans both young and old about the importance of friendship and helping others. Elmo sings and dances his way through numbers, letters, vocabulary, and emotions with his Sesame Street pals and a few famous friends like Melissa McCarthy, Taye Diggs, Drew Brees, Romeo Santos, and many more! Order due date is January 27, 2015. 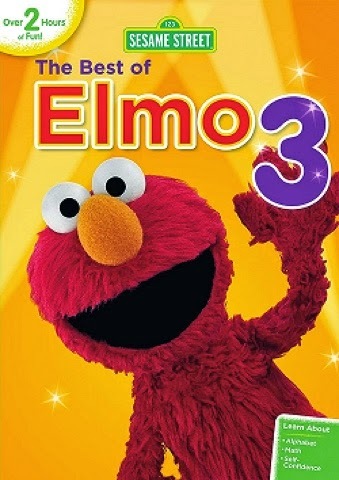 Elmo fans will love this new DVD where everyone’s favorite furry and red friend is reminded of all the fun, friends and music he’s made on Sesame Street. Join Elmo as he does “The Elmo Slide,” finds out about “The Power of Yet" with Janelle Monae, and sings about the number 5 with the band Train. Elmo learns about counting, vocabulary and even how manage his emotions in the hit song, “Belly Breathe” with Colbie Caillat and Common. This special collection is filled with Elmo moments fans will treasure. As an added extra, this release features a special bonus title which will provide over two hours of Elmo! Celebrating its impressive 45th anniversary this season, Sesame Street is the #1 top-of-mind preschool show with moms. The series has received more Emmy awards than any other show in television history, as well as a Lifetime Achievement Emmy Award.